“Look, Mommy! 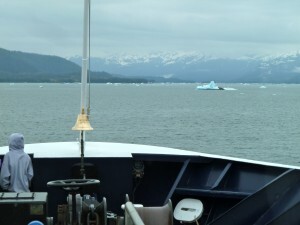 There’s a whole field of icebergs – I hope we don’t sink! !” My son’s screechy voice carried across the far reaches of the ferry as if spit from a bullhorn. Too many Titanic movies had made him very iceberg-aware; although, in fairness to our excellent crew, perhaps not presented in the manner he chose. AK Kid and I were aboard the MV Aurora, sailing from Whittier to Valdez to participate in July 4th festivities around this little Prince William Community of a few thousand people. We had pondered a few options for transportation prior to taking off yesterday; driving the Glenn to Richardson Highways, flying aboard our favorite regional airline – Era Alaska, or taking a boat. 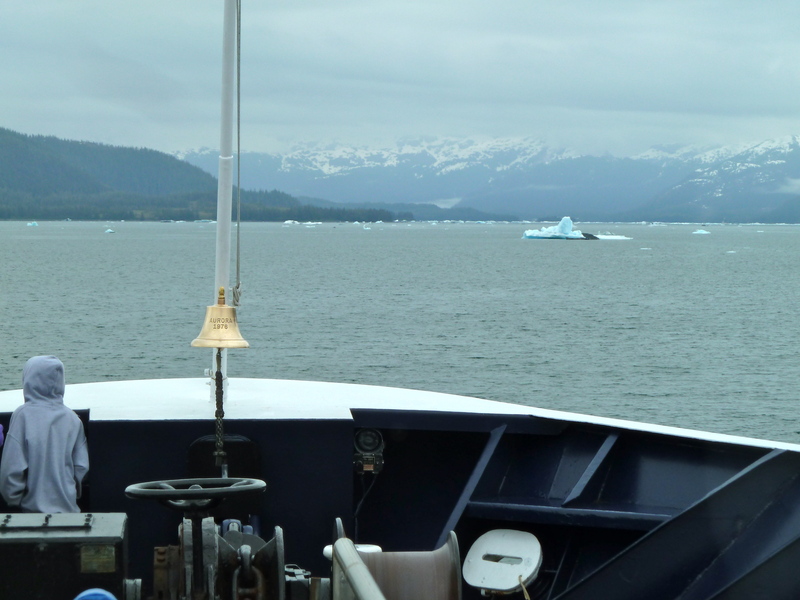 After a wonderful experience aboard the Alaska Marine Highway last summer, tooling around southeast, the ferry seemed an obvious choice for this mother-son adventure. Anchors aweigh, it was. Playing "Wig Out!" with some new friends. Wiggle room: We bring enough stuff to amuse ourselves for days, never mind five hours. Food (galleys are on board, but we like to picnic), books, games, puzzles, movies – you name it, we have it. Kids can spread out on the floor to play, nap, or read, and bigger children will appreciate the independence of wandering to the day lounge or galley to play card games and such. At seven, AK Kid is old enough to do all of the above, and promptly solicited a cadre of buddies to play his favorite game. 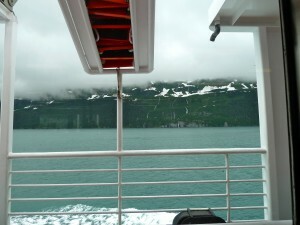 MV Aurora sails out of Whittier on the way to Valdez on a rainy afternoon. The view. Every seat has a view, and there is no bad view. Like driving, but better. As our trip progressed, and those icebergs floating from Columbia and Mears Glaciers kept on coming our way, we did indeed feel sort of Titanic-y; I mean, we were slow, slow going through these bobbing blocks of frozen history, and the view got even better when sea lions and a pod of humpback whales decided to join the party. Even the card-playing club quit to wander outside with we grownups and listen to the ice pop and the whales blow. 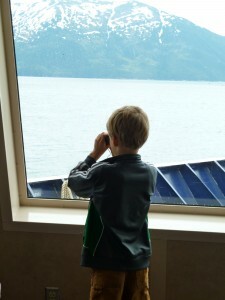 AK Kid looks for wildlife aboard the MV Aurora. Company you keep. 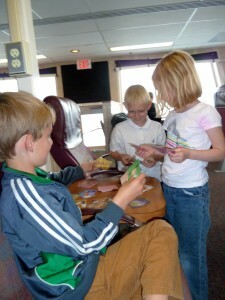 The Alaska Marine Highway serves both tourists and locals, and each promote fascinating conversation with kids. 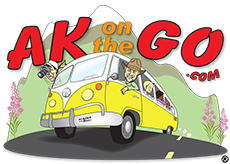 Some folks are headed to or from work, or are delivering goods to tiny towns only accessible by boat; some folks are ending a month-long tour of Alaska by motorcycle and would love nothing better than to discuss their favorite moments with real, live Alaskans. Yesterday was particularly fun, as Dalls Porpoise and whales both were feeding near the ferry, and AK Kid stepped up to mention the differences between the two, greatly endearing him to other passengers as he surveyed the scene with binoculars. Anchors aweigh! Waiting in line at the Whittier Ferry dock. Special Deals. The Alaska Marine Highway encourages family travel, and we love their commitment to showing off the 49th state. Each summer, deals like the “See Alaska Pass” and “Driver Goes Free” tempt us to explore even more of our amazing Alaska atmosphere. Kids under 2 are always free, kids 6-12 are always half-price, so check out the AMHS website HERE for the full scoop. Happy independent traveling, today and always! We’re headed to the fun run, parade, canoe jousting……. 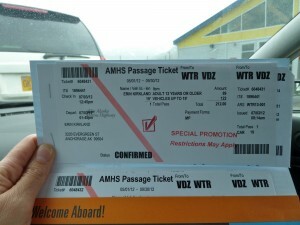 Posted in Alaska Marine Highway, Richardson Highway-Valdez and tagged Alaska ferry, Alaska Marine Highway, Valdez.